A recently published anthology, The Orthodox Church in the Arab World 700-1700: An Anthology of Sources, is a comprehensive introduction to the first millennium of Arabic-speaking Orthodoxy accessible to English speakers. Published by the Northern Illinois University Press, the book is the work of two Orthodox scholars, Samuel Noble, a doctoral candidate in religious studies at Yale University, and Alexander Treiger, associate professor in the Department of Classics and Program in Religious Studies at Dalhousie University in Halifax, Nova Scotia. 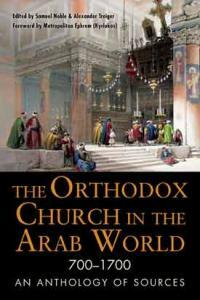 Noble explains that “…in the Western historiography of Christianity, the Arab Christian Middle East is treated only peripherally, if at all.” A sample of the book’s contents includes: An 8th century Apology for the Christian Faith; a work by Theodore Abu Qurra on discerning the true religion; a disputation of the monk Abraham of Tiberias with the Muslims; lives of little-known saints and martyrs; the world history of Agapios; the devotional poetry of Sulayman al-Ghazzi; the mystical treatise the Noetic Paradise; a treatise on the priesthood by Agathon of Homs; the Letter to a Muslim Friend by Paul of Antioch; the unpublished notebook and diplomatic correspondence of the Patriarch Macarius; and Paul of Aleppo’s travel account that sheds light on the history of the Orthodox Church in the Ottoman Empire, Southeastern Europe, and Russia.